Sphinx-like, Diego Velazquez’s Las Meninas (1656) questions more than it answers. Whether the picture is about the painter with a brush in the mirror, or the princess with her parents in the picture gallery, clues endlessly divert through ingenious compositional pacing. Straying from convention, its genre-bending iconography blends portraiture’s fixity and genre painting’s randomness, while its large scale suggests the significant content of history painting. Aside from the painter painting, we don’t know why these people are gathered here. Most appear as in a film still, or like actors assuming positions before the curtain goes up, prequelly. Eve Sussman’s video 89 Seconds at Alcázar (2004) enacts this expectant temporality, improvising action around the moment depicted. The recognizable Infanta Margarita at center stage draws focus, yet the title suggests that her demure, encircling “ladies-in-waiting” (meninas) have more than supporting roles. They seem no more to be protagonists here, however, than do Shakespeare’s Rozencratz and Gildenstern in Hamlet, a notion Tom Stoppard toyed with in his play starring those minor characters. One attendant’s ample skirt, which generates a palpable passage diagonally into space, deferentially curtsies and curves to activate a volumizing aura around the princess’s small, serious form. Margarita looks the part of a leading lady. Her momentous countenance within the work’s theatrical grandeur suggests she could grasp the import of a soliloquy—though hardly its content. Alas, she is too young to even know she doesn’t know; she is “not Prince Hamlet, nor was meant to be”. Our wonder moves on, meeting the cautious gaze of the dwarf and the thoughtful one of the artist to either side of her. Brush and palette ready, even the attendant crouching too near the canvas can’t disturb his dispassionate regard. Could he be painting himself as though from a large mirror facing away from us at the picture plane? Or has he been painting the princess, who has momentarily turned around to view herself in that mirror? Would Velazquez have painted her this way—her poise is quite posed—reversed as we all see ourselves in reflections, trying to see how others see us? Our eyes may mingle among the room’s other near occupants—dog, jester—but a back-lit man in black, starkly framed, demands attention. While his small scale pushes him deep into this perspectival space, his geometrical sharpness and tonal boldness belie the atmospheric perspective clouding its recesses, and pull him to the picture plane. This drama distracts us from the hazy couple in the adjacent mirror entering our vision surreptitiously. Since the vanishing point positions viewers across from the bottom of the door, could this apparition reflect the painting we can’t see on the easel? But, if so, since the angle of the canvas is diagonal (not parallel) to the back wall, shouldn’t their figures appear more foreshortened? Awareness dawns that the royal pair must be outside of and facing the painting, “looking in” as the painter portrays them. The contemporary viewer can assume the position of the king and queen (or if s/he is a stickler for perspective stand to their right) while viewing Las Meninas. 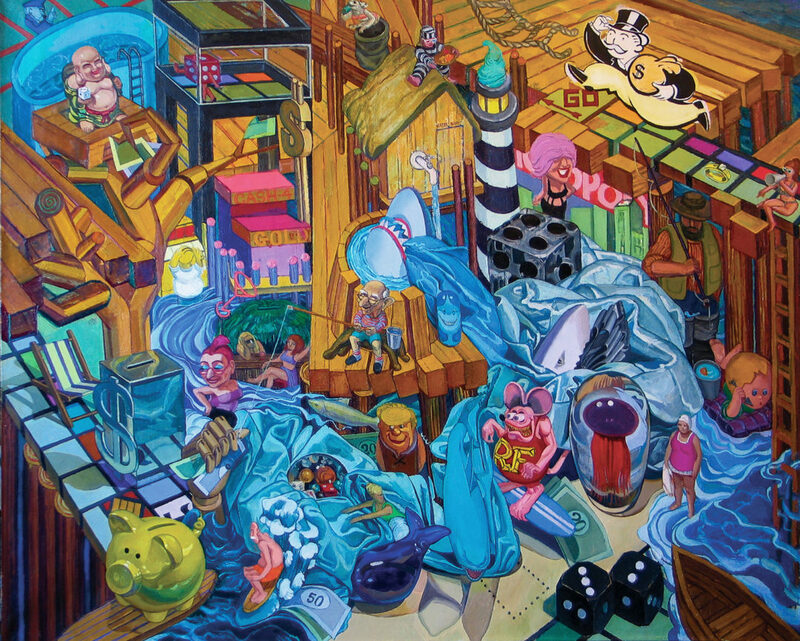 This painting heightens the viewer’s self-consciousness, who as Foucault wrote, “…sees his invisibility made visible to the painter and transposed into an image forever invisible to himself…” Yet you’d have to have seen the king and queen before (or to now be familiar with Velazquez’s oeuvre) to even know the people in the mirror are royals, as little indication of their public personas is described. The image appears painted principally for private consumption. Not only, in Baroque Spain, were painters considered craftsmen, but the Inquisition church did not embrace visual art as the Roman clergy did. Velazquez was not truly discovered by European art lovers until over a century after his death. Nonetheless, the uncertainties of Las Meninas’s imagery feel modern, and resound with postmodern ambiguity. Velazquez’s doubt is not the existential crisis of Prufrock, however, anxiously asking, “Do I dare disturb the universe? In a minute there is time for decisions and revisions which a minute will reverse.” Velazquez’s perception seems closer to the cerebral, searching, whimsical one of Cervantes’s Don Quixote—“Too much sanity may be madness. And maddest of all, to see life as it is and not as it should be”—a Spanish Golden Age hit Velazquez would have known. In Ihor Podolchak’s film Las Meninas (2008), the viewer is presented with a puzzling picture of a family, whose pieces s/he must arrange to form meaning. Velasquez places the viewer in a similar quixotic position, where appearances deceive and meaning gestates without securely delivering. Despite the gravity of its chiaroscuro, Las Meninas imparts a graceful levity. The evocative illuminations realized through Velazquez’s sensitivity to light, despite the economy of paint that dissolves representation into abstract brushwork upon close viewing, makes it all believably nebulous—delightfully clearly unclear. Early admirers compared the work’s striking naturalism to a camera obscura’s casual, clear vision. Velazquez may have used this machine, which made illusion portable through manipulating lenses and mirrors. The painting was originally wider, cropped perhaps after a fire, meaning more of the window and the canvas would have been included. If so, the resulting more proscenium-like shape of the design and a more dynamic, detailed foreground may have delayed our excursion into the pictorial space, suppressing the shadowy presence of the artist, ensconcing him more deeply in his work, literally and figuratively. Should this painting be read primarily as a self-portrait? The scene does take place in the artist’s studio, as would the self-portrait of Courbet (who admired Velazquez, as did Manet), The Painter’s Studio: A Real Allegory…(1855). The huge room had been Prince Balthazar’s, whose death as a young man devastated his father, King Phillip IV. Despite being widely admired for his austere regal comportment, “off camera” Phillip was genial and intellectually curious. Unlike Goya’s sour rapport with his patron, this painter and king enjoyed each other’s company. Phillip had Velazquez paint his portrait many times over the years and liked to watch him paint. He is even thought to have painted the knight symbol, indicating high status, on Velazquez’s chest in Las Meninas after the painter’s death. Of his passing Phillip wrote, “I am crushed”. In his almost forty years in the king’s employ Velazquez played many parts. In addition to court painter, he was curator of the royal art collection, and through palace visitors or Italian journeys to study the Venetians, Caravaggio, etc., he befriended Rubens and Ribera and became a respected connoisseur. (His selections were foundational to the Prado’s collection.) Velazquez was eventually appointed palace chamberlain, a time-consuming job overseeing the royal household. Like the butler in The Remains of the Day, he would have been the head if not the heart of the place, with intimate knowledge of its inner workings and outward appearances. The various points of view Velazquez would have experienced seem conveyed in his Spinners—where behind-the-scenes workers are foregrounded and the presentation of tapestries is backgrounded—and in his Rockeby Venus. In each, figures are depicted both frontally and voyeuristically from behind. 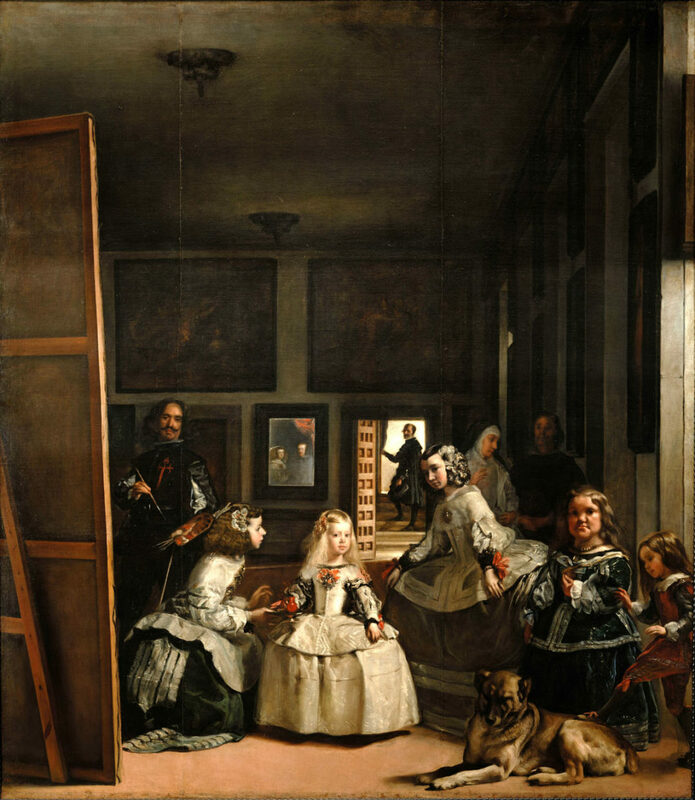 (As Cervantes wrote, “[N]ot everyone is sufficiently intelligent to be able to see things from the right point of view.”) Las Meninas similarly conflates, fuses, and plays with the shifting formal and informal realities of Velazquez’s life at court, where his professional, social and creative roles intertwined. Velazquez was the man behind the curtain in Phillip IV’s court, as he is the man behind the canvas in Las Meninas. No large painting of the royal couple was ever painted by Velazquez, and the scale of the painting on the easel resembles that of Las Meninas. Perhaps the painting is primarily about the painter painting this painting. Or does it describe the king’s quotidian view of his familiars—the painting was in fact called La Familia for its first two hundred years—beholding court members at ease, doing what they normally do? Assuming Phillip – who was acquainted with both sides of the canvas, sitting for and observing the painter at work – had not followed its progress, he must have been as amused as he was impressed when the picture was unveiled. Each figure stirs to attention only as the royal presence is noticed; one lady extends a greeting. As Margarita enjoys her parents’ appraisal, the man in back—the only person the viewer/king sees that the others cannot—closes the curtain to the outside world of official royal responsibilities, placing all within the artist’s world and under his encompassing gaze. Good info. Lucky me I ran across your website by accident (stumbleupon). I have book marked it for later!